Does Your IT Vendor have their head in the clouds? So why do clouds exist? The answer is that we always really wanted them but they are just now technically possible. Nobody ever thought that having as many servers as possible, geographically disbursed under people’s desks, unmanaged or mismanaged was a good idea. It wasn’t. The issue was network. We wanted them close to us, because the network and/or the systems were unreliable or too expensive. We wanted that nice fast tactile and visual performance of the LAN attached server and we wanted to able to reach over and power it off and back on again when it misbehaved. When the networks and management tools improved, we pulled the servers back in from the field and dropped them in a central data center where they could at least be managed by professionals, reliably backed up and in theory provide better service than sitting locally. Now each company has its own servers, uses a variety of technologies for application and management and employs a staff of experts to keep the environments running. The improvements in tools now let them look after a higher quantity of servers, but the servers are still a mish-mash of technologies. Then standards arrive. By establishing standards for operating environments, application development, middleware, database, identity, provisioning, network, management and security suddenly the ability for tools and a few skilled resources to manage servers jump from hundreds/thousands to hundreds of thousands of servers. This creates immense economies of scale savings in operations. From there, now add specialized hardware where application servers and database servers are actually engineered to provide specific performance characteristics at the lowest possible commodity hardware and operational costs. You then add and manage near infinite storage with dark fiber replication across sites instead of operational backups; again eliminating cost. When components break you now literally unplug the server, (the load having already been shifted to an identical server) and throw it away as repair logistics cost now exceed the cost the replacement. So whether the cloud is internal or external (private or public), the approach can dramatically drive down the operational costs of an IT solution. The public clouds add the potential benefit of reducing capital expenditure as they are mostly offered on a pay-as-you-consume model. 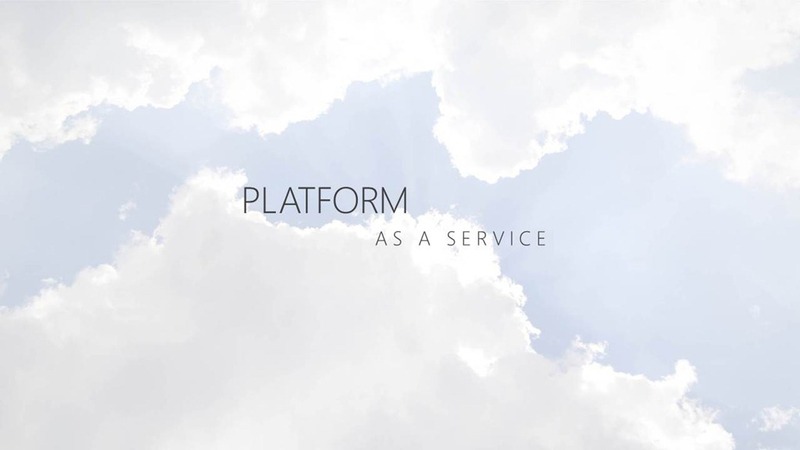 So why does your IT vendor have their head in the clouds? The short answer is that they know that ultimately server-based application processing will become a complete commodity. Will you care in a Cloud model whether your database is SQL Server, DB2 or Oracle? The answer is no you won’t. You will have an expected service level, expected performance level and require X amount of storage, but you won’t care the label on the database. It will have become a complete commodity. All of the commercial databases do the basics, very, very well. To play in PaaS, not only do you have to build and operate monster datacenters around the world, you need to create a complete application development, runtime and management stack to run on those specialized datacenter computers at a cost of many, many billions. It’s all about economies of scale. Why does your IT vendor have their head in the clouds, it’s because the industry has inadvertently created its own killer and set it loose. It has commoditized its high cost specialty products and the only vendor left standing will be the one that achieved sufficient scale and volume to stay in business. How many PC manufacturers are there left? This entry was posted in Technology and tagged cloud, paas. Bookmark the permalink.